NBA scores, highlights, results: Warriors top Pacers, hold onto first place in West; Nuggets beat Wizards in D.C. While a lot of basketball fans were paying attention to the first round of March Madness, true die-hard NBA fans still watched the Association's six-game slate on Thursday night. The Denver Nuggets took care of business against the Washington Wizards in their bid to regain control of the top spot in the West. 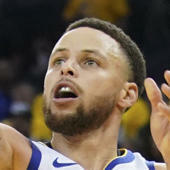 However, in order for the Nuggets to grab that top spot, they needed the Warriors to lose their game against the Indiana Pacers, and that didn't happen. Here's everything you need to know about Thursday night's NBA action, along with Friday's schedule. Andrew Bogut played in his first home game with Golden State since re-signing with the team earlier this month, and he was given a warm welcome by Warriors fans as the Dubs host the Pacers. Bogut previously played with the Warriors from 2012 to 2016 and was a member of their 2015 championship team. Rookie Miles Bridges has had a knack for rocking the rim early in his NBA career. In the second quarter against the Timberwolves, Bridges beat everyone down the court and threw down a monstrous one-handed slam dunk. Trae Young can be absolutely dazzling on the basketball court. Young certainly showed why as he drove the baseline against the Jazz and finished an insane reverse layup. Andrew Wiggins put his athleticism on display against the Hornets. In the opening quarter, Wiggins spun away from Frank Kaminsky and threw down a huge slam dunk. It's a good thing the Suns aren't contenders, because they just lost one of their best players. According to Adrian Wojnarowski of ESPN, Kelly Oubre Jr. is out for the remainder of the 2018-19 season due to a thumb injury.